A WOUND IN TIME: GET READY.. GET SET... GO!!!!!!!!!!!! 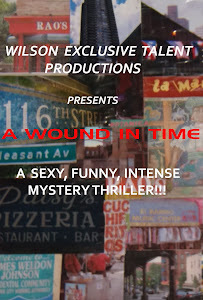 Preparing for our upcoming rehearsal for the next shoot of A Wound In Time: The Upcoming Feature Film. We'll be blocking scenes with Lourdes (Irma Cadiz) wilding out on Tony (Francisco Ramos) on First Avenue in front of Bobby (Evan Davis), the wiseguys, Clinton (Stacey Griffin), Chee Chee (Rock Jones), and the neighbors; with Marta (Christina Laboy) purchasing a rooster; with a young Millie (Millie Ortiz) meeting her future husband Ruben (Ralph Hopkins) on the beach in Matanzas, Cuba; and with Tony chillin' on the beach in Coney Island. The rush is on to get all exteriors done before the weather changes... Thanks to those who helped in this effort.